In short the maritime new building supervision software CODieBOARD# supervision-center is the ideal system for the new building construction and operations departments in shipping companies. CODie’s newbuilding and claims software enables you to make decisions on how to deal with claims against shipyards, ports, stevedore companies, charterers, and others. It efficiently handles all rectifying defects, damages, and deficiencies that have occurred. The maritime CODieBOARD# supervision-center ensures that you will always have all necessary facts and figures instantly available. Therefore, it is easy to track costs and workloads involved. When talking to shipyards, suppliers, charterers, or insurers, the well-founded arguments provided by the new building supervision software help you to prove your point. See how our supervision-center can help you! CODieBOARD# supervision-center handles all guarantee claims between concerned parties via mail exchange. The financial completion of guarantee claims is of the utmost importance for every shipping company, even before the administrative time savings is taken into consideration. CB#supervision-center deals with all damage caused on board a vessel and ensures that your company can keep track of all damage reports. Different kinds of damage, like stevedore or off-hire damage, are extremely important for every shipping company. This information is safely stored in the central database. Our vessel new-building system is designed to strengthen your position when negotiating with yards and insurance companies. It can provide a complete overview of all involved materials, labor due to accidents or construction works and lay out cost analysis. Ship Newbuilding was Never Easier! Facilitate good teamwork with our supervision-center for yard teams! CB#supervision-center - From construction to scrapping. The maritime CODieBOARD# supervision-center ensures that you will always have all necessary facts and figures instantly available. Therefore, it is easy to track costs and workloads involved. When talking to shipyards, suppliers, charterers, or insurers, the well-founded arguments provided by the newbuilding supervision software help you to prove your point. Further, the newbuilding supervision comes with a central file repository where you can store, view, and print any attachments, like documents, forms, and pictures from each individual case. CODieBOARDCB#supervision-center Claims handles all guarantee claims between involved parties. The different statuses of each guarantee claim can easily be seen and understood at any time in your office and can then be easily reported to shipyards, manufacturers, or any other interested party. All invoices and documents, as well crew or other officers’ wages, are centrally stored as a cost factor in CB#supervision-center. Information such as the nature of a claim, priority status, and guarantee period can be entered into the software. The analysis of previous claims data will assist you in decision-making for new vessel construction, as well new acquisitions of equipment or machinery aboard your vessels. The claim supervision software precisely monitors a wide range of different claims within your fleet, reduces costs, and increases the efficiency of your company. CODieBOARD# supervision-center Damages deals with all damage for example due to accidents or third party influences (e.g. stevedore damage) on board your ships and gives overview of all damage reports and involved costs. Reports between vessels, owners, charterers, shipyards, etc. can easily be generated via mail exchange. 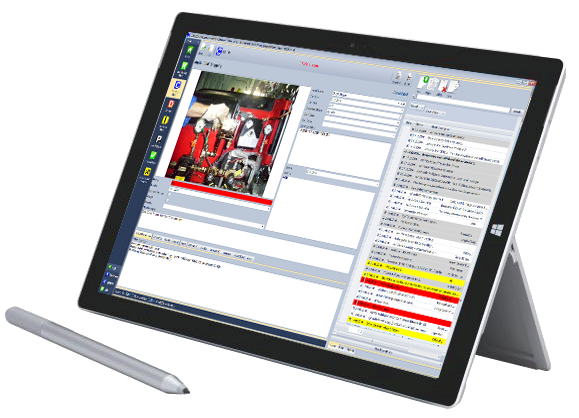 A full history of all vessel damage, together with all invoices, documents, and costs, is available in CODieBOARD#supervision-center Damages at any time. The analysis of damage reports concerning manufacturers, shipyards, vessels, ports, or other suppliers is a fundamental requirement for effective decision-making about new vessel construction projects, as well as new acquisitions of equipment or machinery aboard vessels. Using our maritime software will reduce costs and provide much-needed and important information to your company’s purchasing department, as well as to the superintending department. You can see at a glance what’s happening in your fleet and in the shipyard(s). Damage and claim reports are harmonized and made available to all involved parties. Reports are designed to meet the requirements of inspection and newbuilding departments. A digital photo and file storage and archive capability is available for each report. The online 24/7 real-time reporting provides you with up-to-date information.